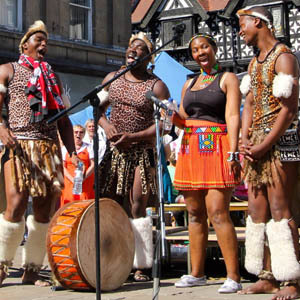 ZULU Tradition offers a programme of outdoor performances, workshops and indoor performances for any festival or event. 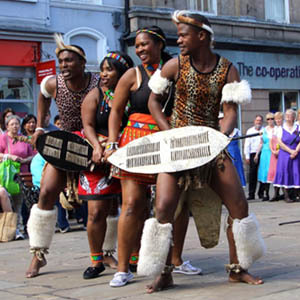 They are perfect for a dramatic main stage spot with PA and lighting, but they also interact beautifully with audiences of all ages at acoustic performances indoors or out..
A typical outdoor show from ZULU lasts for 20 - 30 minutes (multiple spots if required) and encompasses: various genres of traditional dance integrated with song and chant and supported by drums. They make a colourful and vibrant show and interact brilliantly with audiences. 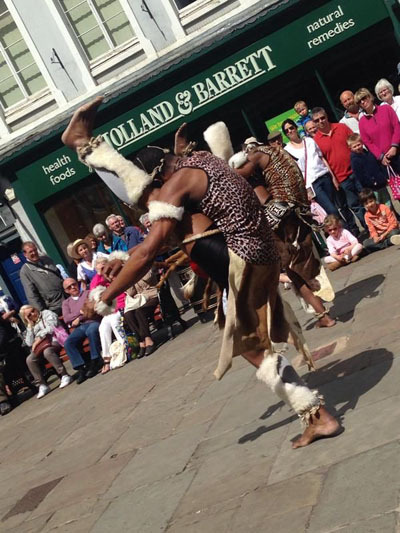 They are happy to share a dance stage with other dance teams as part of a full programme of events or to take centre stage by themselves..
An optimum stage set should be approximately 40 - 45 minutes. The show includes song and dance. 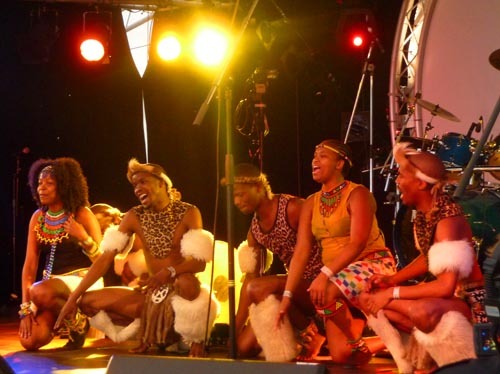 All of it is in traditional costume.Stirring African harmonies, traditional and traditional-style songs, favourites such as Shosholoza, Mbube (the original version of 'Wimoweh') and the South African national anthem, Nkosi Sikelel' iAfrika. Workshops generally last for a minimum of 30 minutes but can be stretched to accommodate your timetable to 45 minutes or one hour. They are happy to do two separate 30 minute workshops (one song and one dance). All workshios are fully interactive and encourage full participation. The members of Zulu are happy to do 'Meet' sessions, mixing and matching material from their introductory session with questions from the audience. 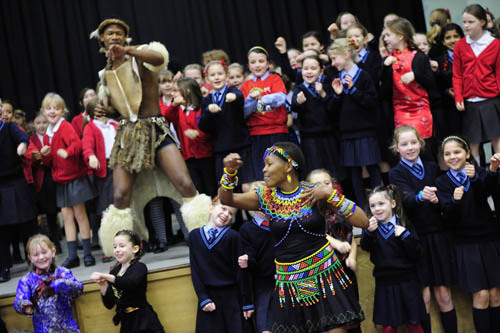 See the education page for details of ZULU Tradition's work in schools. They are brilliant with all age groups from nursery to high school and are happy to do a day (or several days) in your local schools leading up to your festival. They can also do a residency - several days in one school. Obviously this incurrs an additional fee, but it is often possible to get extra funding for educational projects and the festival and school can share the cost.